Human spatial relational reasoning has been investigated by presenting participants with premises like: “The triangle is to the left of the circle, the circle is to the left of the square. Which relation holds between the triangle and the square?” Participants are expected to interpret the descriptions in a way that corresponds to the logical options that are theoretically available. 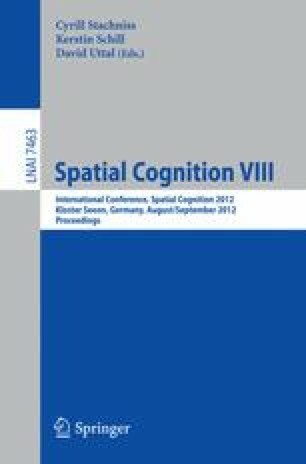 Recent findings on spatial language usage highlight a range of pragmatic principles that speakers intuitively adhere to when producing and comprehending spatial relationship descriptions; these appear to contradict the principles used in relational reasoning studies. In order to clarify the relation between speakers’ intuitions and the descriptions used in relational reasoning tasks, we present two studies in which linguistic representations of relevant configurations were elicited. Results highlight the systematic patterns speakers use in describing these configurations, adding new insights to research on spatial language usage across various levels of analysis. We argue that the identified principles may interfere with the reasoning processes investigated in earlier studies, and suggest that future studies should adequately account for the principles underlying intuitive spatial language use.